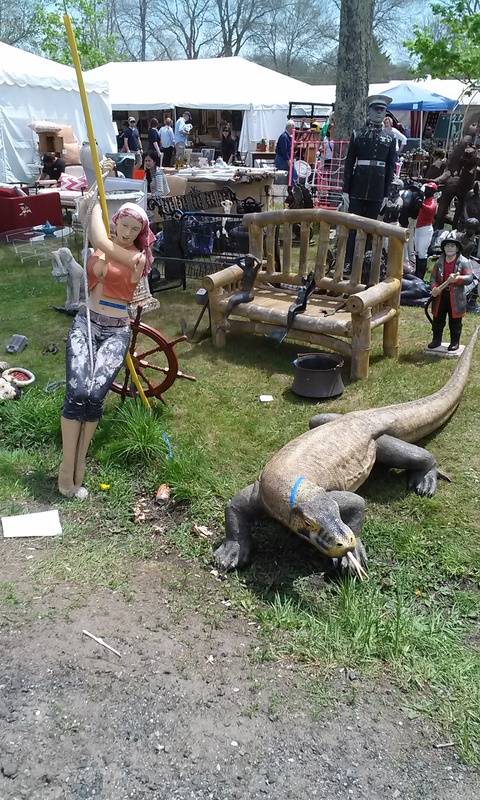 The May edition of Brimfield 2016 has come and gone. We haven’t photographed our purchases yet, that will come later. What we do have are the photos we took as we wandered around. 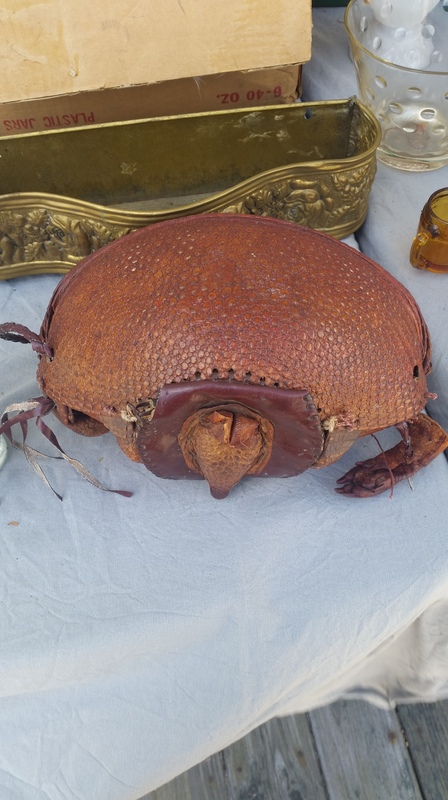 These are the weirdest photos of items we encountered from Thursday-Sunday of last week. And some of them are truly odd. Others reminded us of The Bloggess, so we went ahead and snapped them. For posterity. We did not purchase any of these items. This Komodo Dragon is not, sadly, taxidermied. It was plastic or rubber. At a guess I’d say it was from a mini golf course. Then again it could have been home decor, who am I to judge? Where his maiden friend in the perilously small shirt came from I have no idea. Why they’re next to each other is even more puzzling. The blue stripe on each of them is painter’s tape with a price, though I do believe that the dragon had been sold. The other thing we ran into a LOT this year was dachshund stuff. This was largely because we had Thumbelina and Dash with us. Dash is pretty hard to miss as he was so excited he was all over the place. This led a lot of vendors to call out to us or otherwise flag us down to show us their dachshund stuff. Doxie bobbleheads, stuffed animals, giant plastic figures that weighed upwards of 30 lbs, books, etc. You name it, if it had a dachshund on it we saw it. The weirdest dachshund item was probably this. 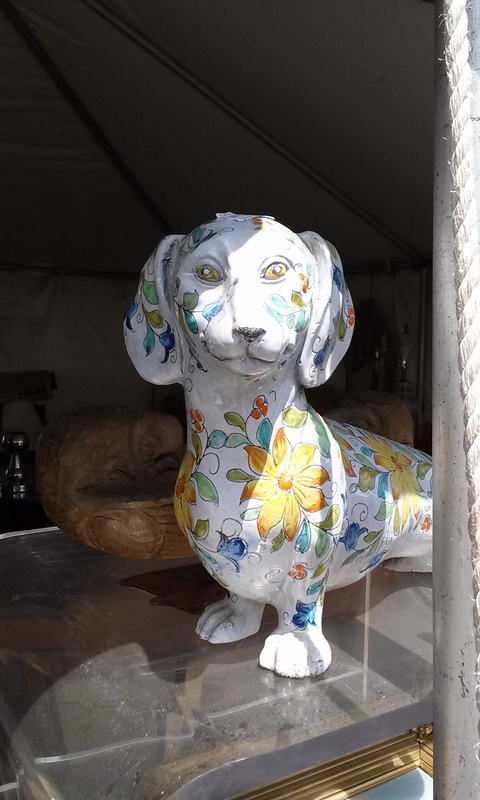 An albino porcelain dachshund with tattoos. This doggie was probably made in Italy. It’s about the size of a standard dachshund and it was somewhere north of $500. We didn’t buy it. Geoff doesn’t like tattoos. Why a plastic bag sign? Why not? It was fairly windy while we were there and I’m going to assume that the vendor of this item got tired of answering questions about what it was. 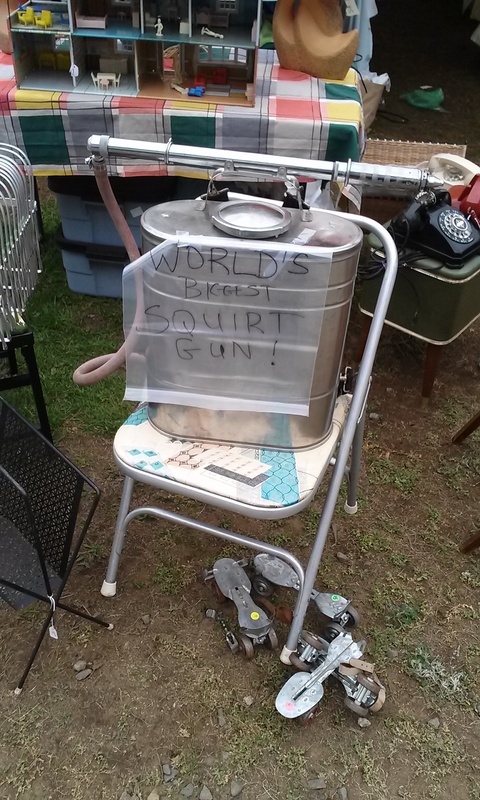 That and they probably decided that they really didn’t want to take it home so they decided to call it a squirt gun. Bonus points to any millennials who know what those things on the ground next to the chair are. Christmas intrudes on more and more holidays each year. There’s no way this set up was an accident. 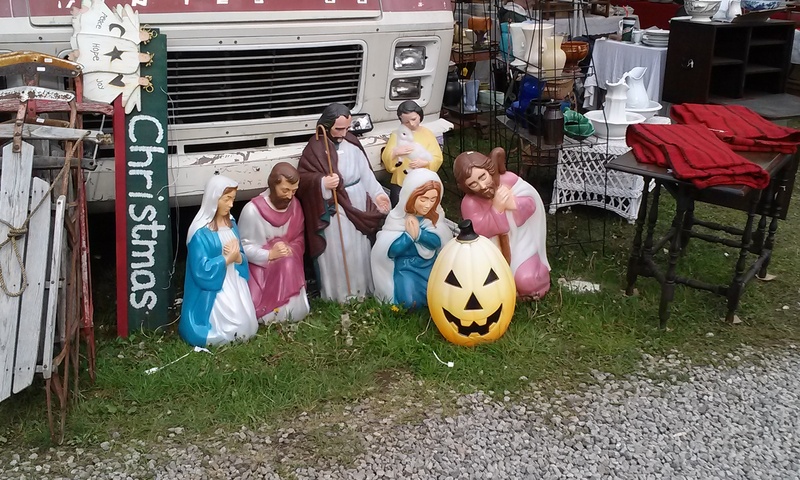 I’m quite sure that the person who set this up, with two Marys and two Josephs, knew exactly what they were doing. Note also the giant pile of flexible flyer sleds on the left side of the photo? That’s the type of sled that tried to kill me when I was 10. They were everywhere this year. It was like they were coming back from my childhood and stalking me. Next year I’m bring my hatchet in case that happens again. Sheesh. 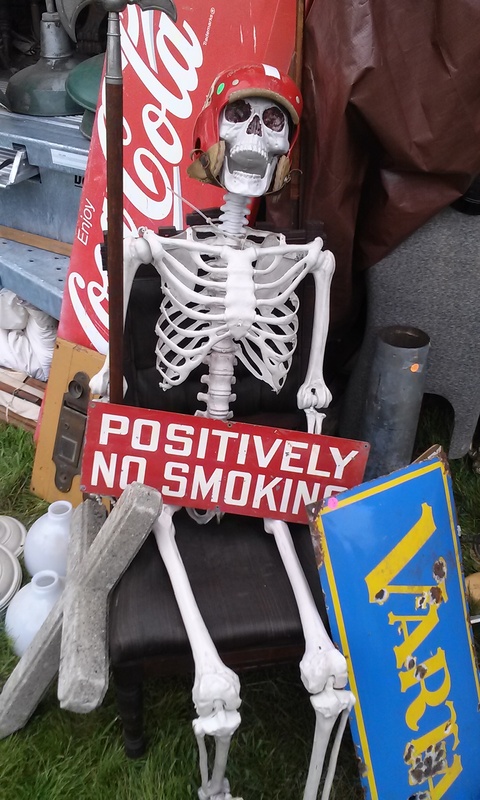 This skeleton was posted at the entrance of a tent. It’s wearing a helmet, carrying a halberd, and has that totally apropos sign. Naturally I had to go inside the tent. This is where I spied the first of The Bloggess appropriate items. Before I got entirely into the tent I saw these. 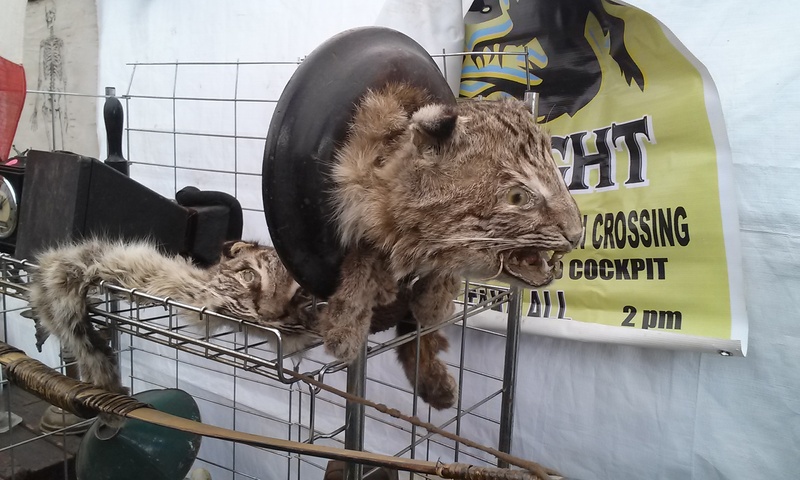 A pair of badly taxidermied bobcats. The one in the front is mounted to the wooden base. The one behind (twin?) is a bobcat stole. For real. It has paws and everything. Naturally I didn’t actually touch either of these. I mean, I am a lady. But I just had to snap a photo for Jenny. Then I actually looked around the tent I was in and I realized that something was very wrong. Or, depending on your perspective, very right. 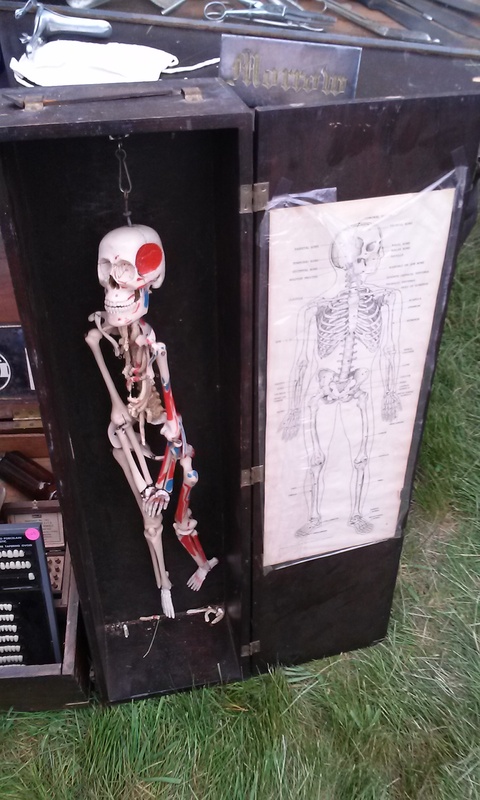 A traveling anatomical model? 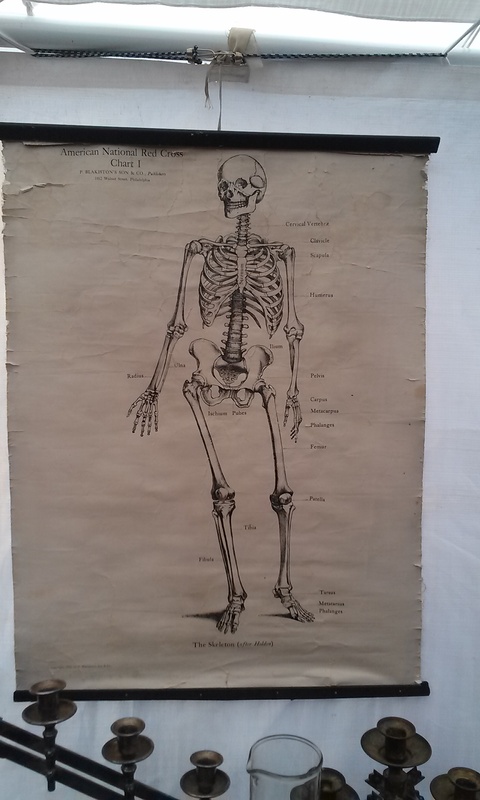 Or perhaps easy break points marked out on bones? This was about 3 feet high and I’m quite sure that it looks a bit like a casket when closed and laying down. Next to it was this. I hope this was a salesman’s demo kit. For a traveling dentist? Maybe? Please??? Yes. Those are teeth. I hope they’re fake teeth. 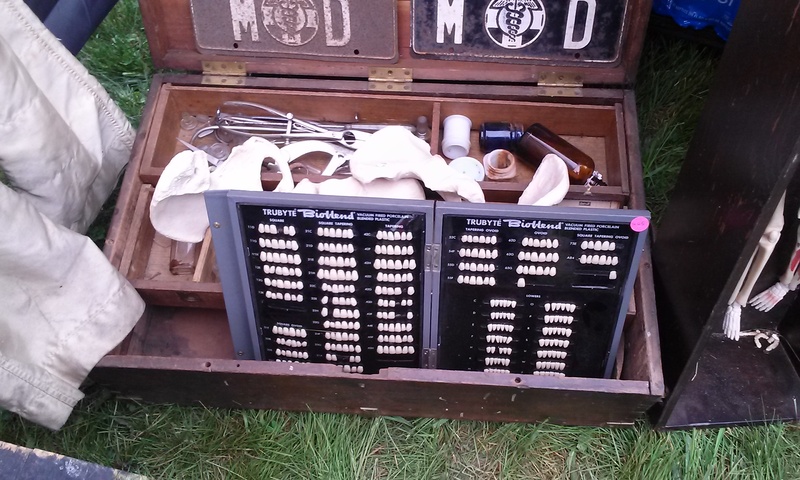 Behind the teeth are a variety of human bones and different old fashioned surgical/dental tools and bottles. In a wooden traveling box. I’m sure there was some kind of price on the pink sticker, but I didn’t check to see what it was. And then there was this shelf and I knew I was in an entirely new dimension of “antiques”. You might not be able to read that label up front on the jar. It is advertising human ribs for sale. Yes, really. I have no idea if it is legal or not to sell “prepared human bones” and I’m quite sure that I don’t even know what “prepared human bones” are. Braised? Baked? Rubbed? Probably a bad question to ask a vegetarian. The scarier part, if that’s even possible, are the surgical instruments in the back. 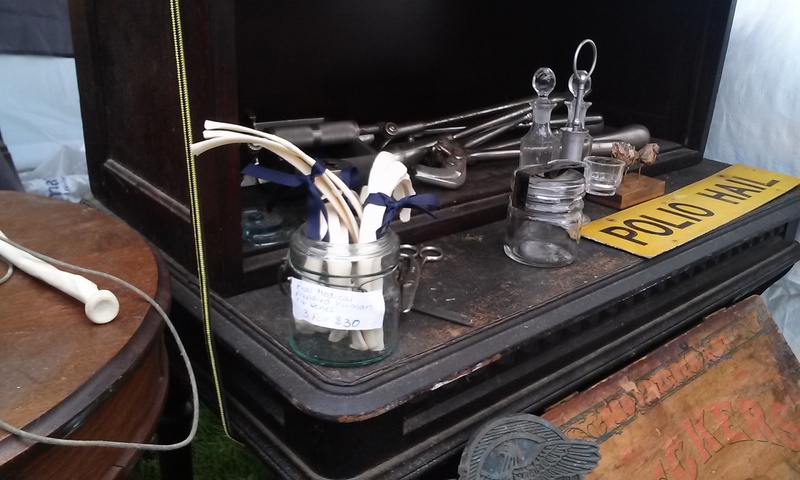 There were some steel instruments back there that looked like things out of some sort of horror story. On my way out the door I spied this. I kind of wish I’d asked how much it cost, though I’m also sort of glad I didn’t. After all, it had been traveling with all of that other stuff which was obviously haunted. I would absolutely hang this up. Except for the haunted part. Once I left the Tent of Death there wasn’t much else to see that day. Over the next few, however, we did see more things that were horrible but in a more prosaic way. 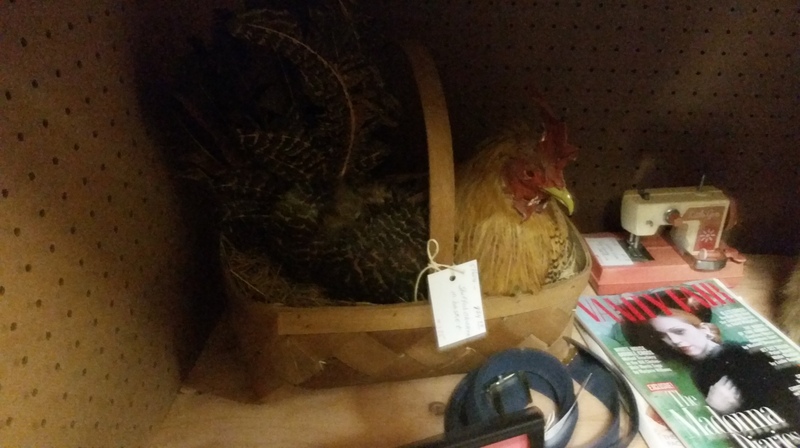 Should you find yourself in need of a taxidermied chicken in a basket they do exist. I reached out and checked and the feathers are real. It’s a little dark on the shelf so it’s a little hard to see, but it has pretty nice tail plumage. For, you know, a basket chicken. I’ve seen stuff like this before but I’ve never seen the head be the clasp. 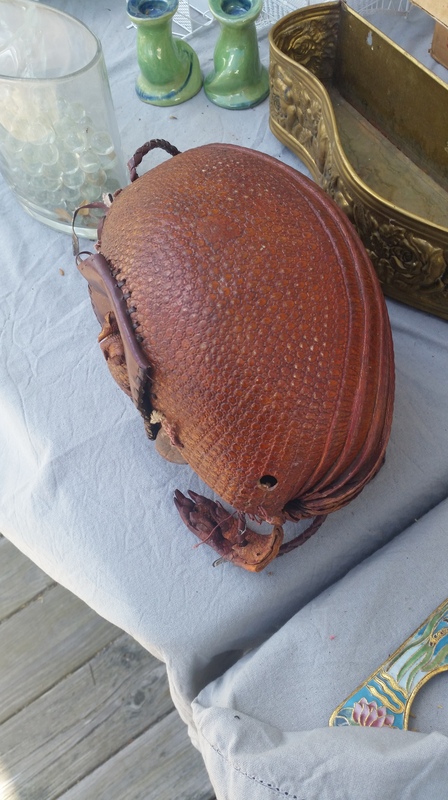 I just… poor armadillo. It almost looks like a football. A football with leprosy. The most disturbing thing from this same dealer was the following. You have been warned. I don’t even know what to say about that. I do know that not only were Geoff and I horrified but that when we showed it to my mom she turned the LP (that’s a record, millennials, it’s a cooler version of a CD) to face the wall so as not to offend “the children.” There was a doll across the aisle. I didn’t disagree with her. 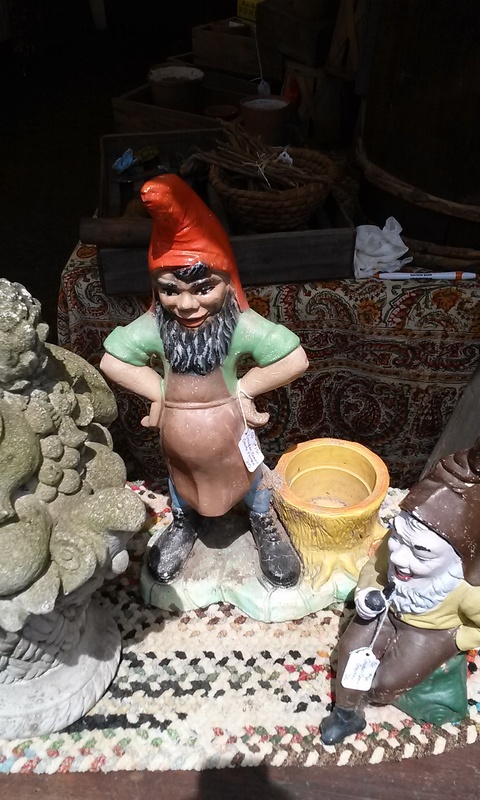 Judgmental bearded pregnant gnome is judging you. At least he isn’t smoking like his little albino buddy on the right? I don’t know, I got nothing. There will be more soon. Once we get our purchases photographed we’ll have more posts up. Until then, enjoy? Wow, I just listened to the link you posted. That may be one of the worst musical experiences of my life. I get that it’s parody, but. Wow. I’m so glad I didn’t have to listen to the Frampton original. Going to get the brain bleach now. Well, it WAS the seventies. 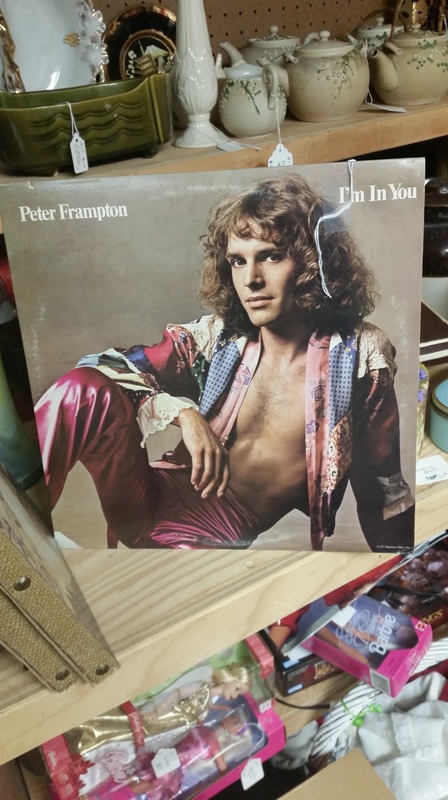 But oh Lord, Peter, those clothes… that hair… that pose… eeek. I never had much of a vinyl collection – it was mostly cassette tapes to play in my boom box.